poses a serious threat to the corner. 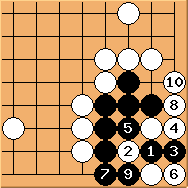 Black should not have ignored it. How can white punish black? is still urgent. Unlike in Diagram 18.5, no longer works. can simply connect back home. 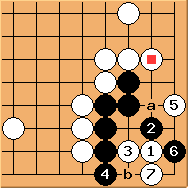 While is a tesuji, blcak cannot play 'a'. So the corner is dead. So has to block here. is a nice tesuji. Readers may remember from earlier experience (e.g. Diagram 2.3, 3.3, 4.3, etc.) 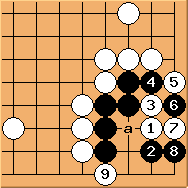 that once white forms an eye in the corner, black would be in trouble unless there are plenty of external liberties. This Eye versus No Eye race is hopeless for black. Also note that if plays or *w9*, white still replies at . We've seen tesuji before. Just to show it doesn't work here and prepare the discussions in the next article. Unlike in Diagram 18.7, also works. 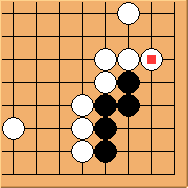 This is because with the help of , white can reach now, reducing black's eyespace. 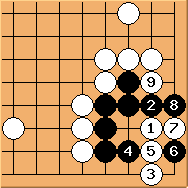 In the end 'a' and 'b' are miai points so black is dead too. Conclusion: Black can not survive.